SOLD – The Renfrew at Woodland Creek – affordable family living next to parks and schools in Sooke, BC. SOLD – The Cedar at Woodland Creek – 2013 Gold CARE Award – Best Single Family Spec under 2,000sf. 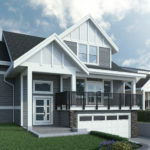 Introducing the Sheringham, the first of several new homes at Woodland Creek in beautiful Sooke, British Columbia . The Sheringham offers spacious family living with the bonus of a bright legal 1 bedroom basement suite situated on a large lot with views south to the Olympic Mountains and Sooke Hills.